When you’re looking to purchase the best wakeboard rope and handle for yourself, it really boils down to personal preference. Now, obviously quality does come into play but each rider will have their own favourite. What determines a great wakeboard rope? If you’re a beginner, it might take a bit of experimenting before you find the right one for you. Ideally, you’ll practise with someone else’s before make a purchase. If you’re a bit more experienced, the likelihood is that you’ll have some idea of what you’re looking for. 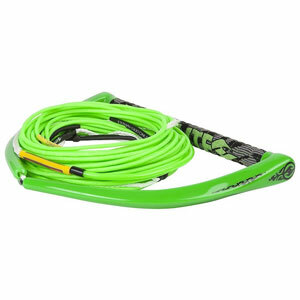 Either way, we aim to make the shopping experience for buying a good wakeboard rope and handle easy for you by reviewing some of the top ones. *Star ratings are based on the views of the editor. 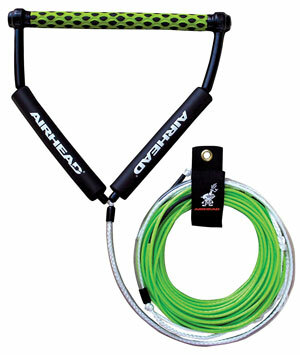 Offering no stretch, this 70ft-long Airhead wakeboard rope is high quality and favored by many wake boarders. The reason no stretch is good? It allows for a fast response when cutting to the wake. ​The handle is 15in wide with foam floats and PVC tubing for good durability. The line itself is incredibly stiff and rigid which means that it shouldn't twist on itself or get any kinks. The handle on this wakeboard handle floats which makes finding it no problem at all if you let go. ​If the rope at full length is too long, then there are 5 sections which you take out to fit to size for the rider. Due to the fact that the wakeboard rope truly is no stretch, you'll have a more predictable pop every time and a smoother run into the wake. This will help to avoid crashes and improve your riding consistency. 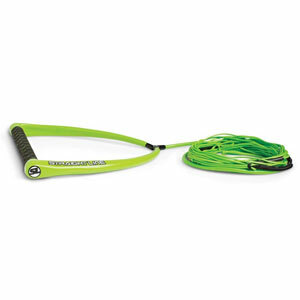 Sitting at just under $100, this is one of the best wakeboard ropes and handle you can buy. 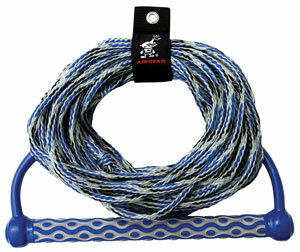 This is a super high quality 65ft rope, providing good grip and a predictable ride because of its little stretch. A good length, the rope is 65ft and adjustable in 5 sections; 45ft, 5ft, 5ft, 5ft, 5ft. ​If you're worried about finding the rope in the water, then its bright color and the fact that it floats makes it easy for you. For added durability​ the leader is covered in PVC tubing, as is the leader line in order to resist abrasion. The handle has been built for maximum comfort and grip, with round 29mm suede​ and quilted EVA padding. This rope and handle is one of the best for both beginners and experienced riders alike. Hyperlite is a brand known well by both beginner and more experienced wake boarder for producing high quality gear. Their top notch wakeboard ropes are no different. The handle has buoyancy pl​ugs which keeps it afloat in the water. In fact, both rope and handle float because of their silicone coating. Overall length for this rope is 75ft of which is 55ft of mainline rope, two 5ft sections and two 2.5ft sections. This will allow you to cater the rope for the style and needs of the rider​. 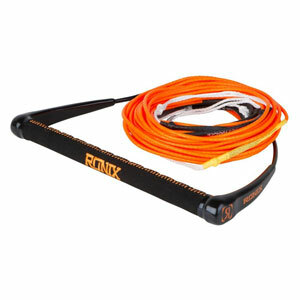 Although at the higher end of the price spectrum, this Ronix wakeboard rope is one of the best, with the small details making a difference to the riding experience. ​The handle is 3mm thick and made with memory foam, making it truly one of the most comfortable handles you can purchase. It's also anti-roll and floats in the water. ​The rope is 80ft, strung with 12-strand Dyneema rope and comes in 6 adjustable sections which will suit any rider's preferred length. If you're fed up of the wakeboard ropes getting tangled or fraying, then you'll be pleased to hear that this one is is tangle resistant and has been made with abrasion resistant material . This is just about the cheapest wakeboard rope and handle you can get. We've placed it on the list for those who are looking for a cheap purchase and a rope that will do the job with little fancy extras. The rope is adjustable by three sections, meaning you can have it at 45ft, 55ft or 65ft. It doesn't claim to be no-stretch, however it does provide very little stretch. For better grip, the handle is squid patterned and EVA wrapped, with an aluminum core which allows it to float. Likewise, the 16 strand rope is also designed to float on the water. So that it doesn't tangle when stored, your purchase will come with a rope keeper. This is extremely useful, especially for a cheaper rope. Storing it with this wall also improve its durability over time. Who should buy this rope? Ideal for beginners who don't need anything super fancy or for those who will be towing less experienced riders. It can also act as a great spare wakeboard rope, in case you have a problem with another one. Just like when you go through the wakeboard buying process, choosing rope length for wakeboarding can take a bit of experimenting to get just right. Many think that the right wakeboard rope length is just a case of choosing a length which allows you to jump wake to wake. Sadly, that's not the case. So that the the wake is smaller, beginners and intermediate rider tend to opt for a shorter rope. This makes sense when starting out, especially if you're working on your wake to wakes. 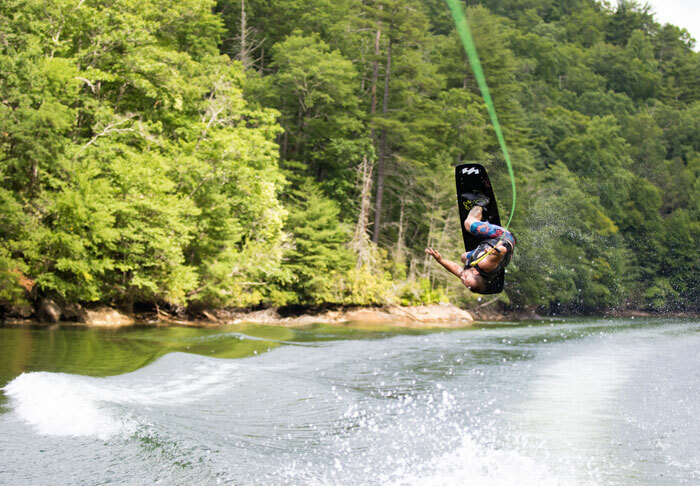 ​However, while reducing the rope makes jumping the wake easier, it also gives you less time to lead into the wake and set up for the perfect pop. One of the best ways to determine the right rope length for you is to line it up when you're riding. If you ride right next the wake, then you'll know where you'll hit it on your approach. The best spot to hit the wake is just before it curls. So, if you find that it's curling behind you, then you probably need to lengthen the wakeboard rope OR you're going too fast. The reverse is true if the wake is curling ahead of you. Don't be put off going for a longer rope length. Yes, it'll be harder at first to get the wake to wakes with ease, but you can take your time with the your approach. This will allow you to gradually build your speed. When you do get in the air, you'll have a lot more hang time to perform tricks, allowing to extend the hold on grabs. The material of your wakeboard rope can affect the way it pulls you, its durability and if it'll tangle easily. Usually, a rope which offers little to no stretch is best as it gives your a more predictable ride and pop every time. A rope with slack in it will make it harder to predict how it will act, resulting in less consistent performance by you. ​The best wakeboard ropes will range between 55 and 80 feet, with 3 or 5 adjustable sections so that you can size it to your needs. They're generally pretty easy to adjust, being able to take off or add on a section if needed. You may need to adjust the length of your rope based on your ability or the size of the wake. This kind of rope is very light as it is made out of fibre, but is actually stronger than steel. This means that it's highly durable and will float well in the water. ​This rope isn't as strong as the others, so it gives a small stretch. What this means, though, is that it is a cheaper option if you're on a budget or need a spare rope. ​The length of the wakeboard handle is normally between 13in and 15in. Longer handles can make it easier to perform tricks in which you need to swap hands, as there is more room to grab it. It's not a huge consideration, however the diameter of the wakeboard handle comes into play if you have particularly small hands. Women and children tend to opt for a slightly smaller handle so that it is easier to grip. If you're new to the sport, picking the right wakeboard rope can do wonders for your learning experience. Likewise, choosing the cheapest one on the market, or just simply the wrong one, can have an impact and make it harder for you to learn. Many people wrongly assume that they can use the same rope and handle as they do for waterskiing. This is actually not the case for various reasons. Although they appear similar, specific wakeboard ropes are designed to maximise air time and make the cut into the wake as smooth as possible. Often, wakeboard ropes will be in 5 sections, which allows you to adjust the rope as you progress. At the start, you'll likely be on a shorter rope which will allow you to clear the wake easier. You can then begin to challenge yourself by increasing the length and thus widening the wake. Having a longer rope will also allow you to edge in to the wake faster, creating more height and distance.